Every Friday starting at 11p (that usually runs until 2a! 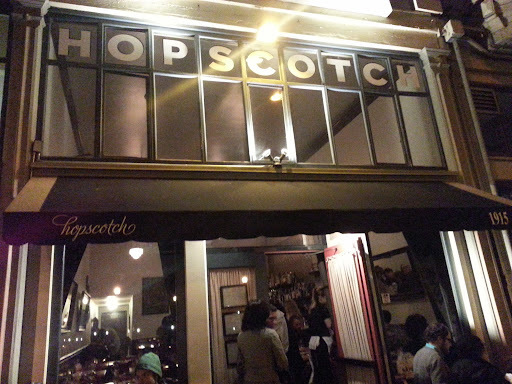 ), Hopscotch does a ramen pop up, which isn't far off from their normal dining fare. 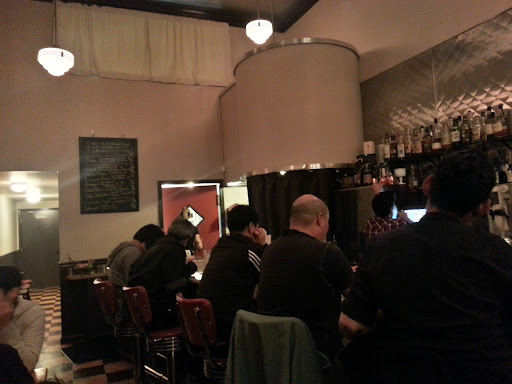 With only a handful of tables and some bar seating, there is a small wait for a table here. The diner-esque feel with the high stools on the counter to the checkered floors sort of reminds me of Nombe in the city. There are only a few options for appetizers on the menu: panko potato korokke, seaweed salad, kimchee, and edamame. The only thing that looked interesting was the potato korokke. I'm no stranger to these deep fried balls of potato, but this one didn't have much flavor. I was a little bummed that there was no tonkatsu ramen on the menu. The only ramen choices were: shoyu, miso, and veggie. I'm a little doubtful on how flavorful veggie shoyu can be so the other two ramens were the main choices of the night. The shoyu ramen comes with jidori egg, nori, negi (green onion), bean sprout, bamboo shoots, and bok choy. For additional $4, you can add chasu pork belly, spicy braised beef tongue, jidori egg ($3), and extra noodles ($2). The noodles are cooked al dente, which is a good thing. The egg surprisingly came with three halves, which made me wonder what happens when they end up with an odd number of bowls. The broth was too light and lacked any depth in flavor, but the pork belly was decent. Not exactly the style of pork that is usually served in ramen. The miso ramen uses a pork broth with braised pork chili paste and sliced chasu pork belly. Spicy braised pork tongue was added to this bowl, but didn't look or taste like I expected it to. The pork tongue was shredded up and very salty. With all the pork and beef ingredients, I was surprised that this bowl was also quite flavorless. The dessert was probably the best thing of the whole meal, but that doesn't say much. The matcha (green tea) ice cream showed no restraint with the bitterness, which I loved. Also, usually not a fan of red bean, but the hard, sweet red beans (azuki) was a nice contrast to the creamy ice cream.